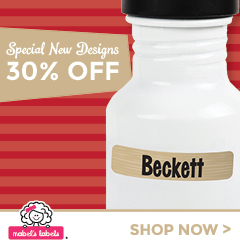 Cyber Monday Sale – 40% off at Mabel’s Labels! Beginning Monday, November 26th through Tuesday, November 27th at 5:00pm, Mabel’s Labels is ringing in the holiday season by offering 40% off Skinny Minis, The Basic Kit, Shoe Labels, and Preschool Labels. Mabel’s Labels products make perfect stocking stuffers, party favors and personalized add-ons to other gifts. Hurry – before this offer ends! Happy Shopping!